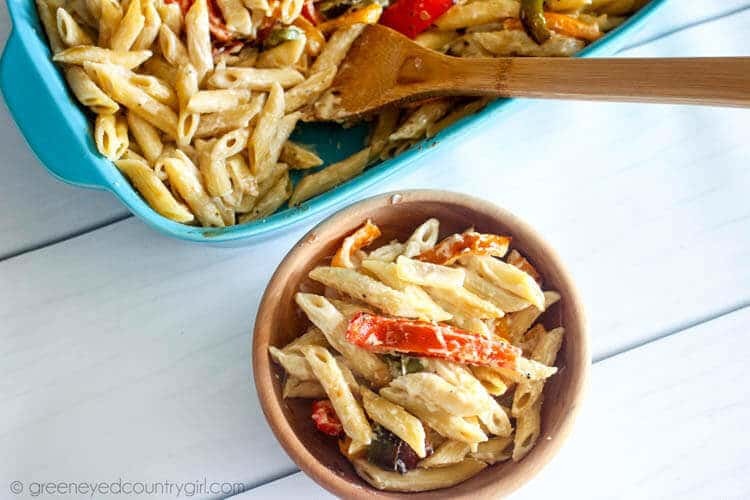 Roasted Peppers give this Alfredo Penne Pasta the most delicious flavor ever! 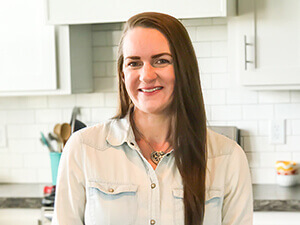 SUCH an easy meatless dinner or lunch!!! Reheats well too! I LOVE roasted vegetables. I haven’t roasted any variety yet that I haven’t absolutely drooled over. I’m not sure what it is about them exactly, maybe because it’s just different than steamed or boiled. 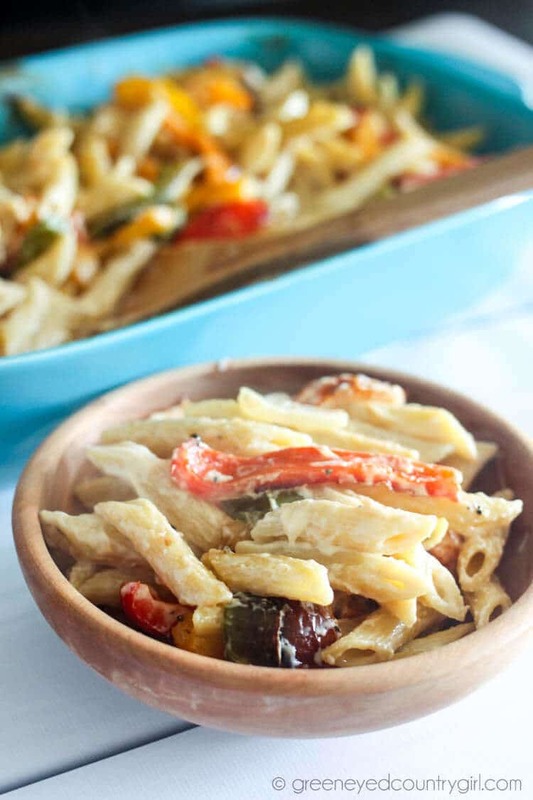 For this recipe, I used bell peppers, penne, and jarred Alfredo sauce because that’s what I had in my pantry/frig. Super quick to throw together and my husband keeps asking for more of it. 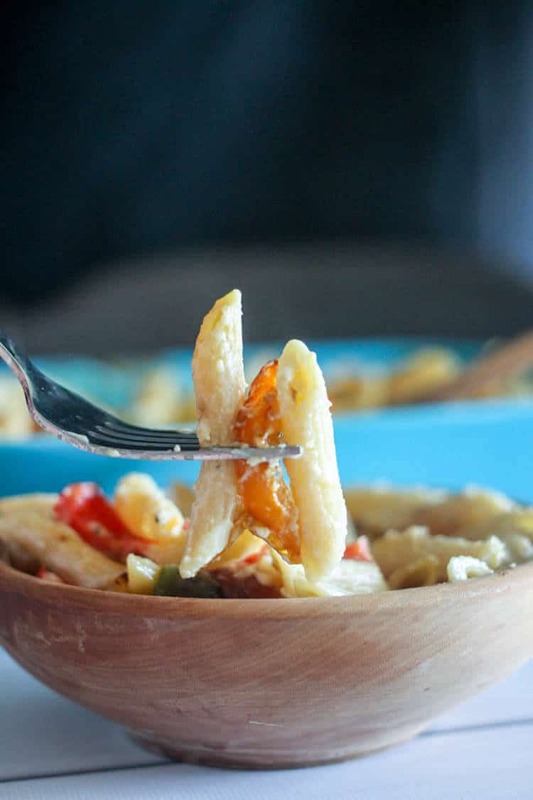 All you need is 1 red bell pepper, 1 green bell pepper, 1 orange bell pepper, 1 yellow bell pepper, 1 onion, a box of penne (or your favorite pasta shell) and 1 regular sized jar of Alfredo sauce. Mine was four cheese. YUM! 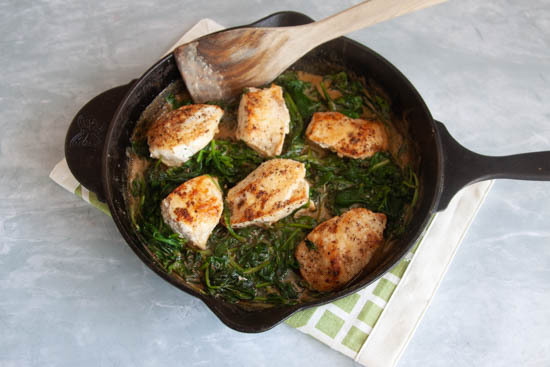 Adding chicken or even smoked sausage to this would make it even better and manlier. My husband doesn’t usually like pasta (or any entree) with no meat. 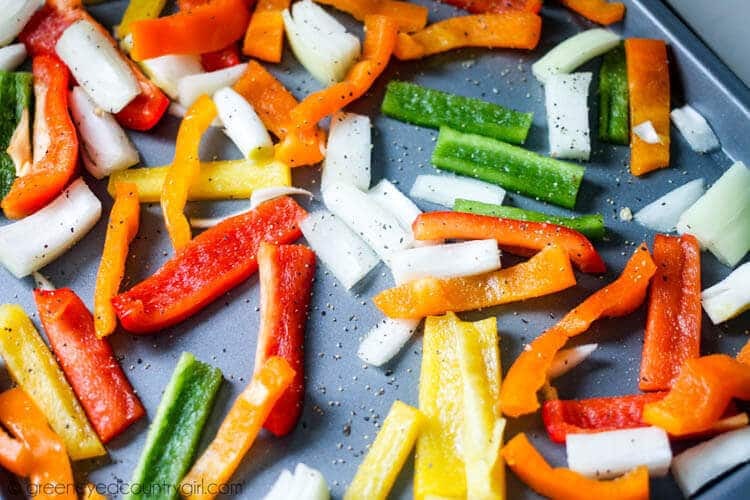 Slice up your peppers and onions and roast them while you boil water for your pasta. 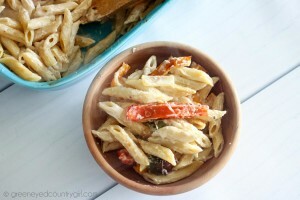 Then, toss everything together, peppers, onions, prepared pasta, and alfredo sauce. What is your favorite pasta dish? Tell me in the comments below ↓. Slice the peppers and the onions, spread out evenly on a baking sheet, drizzle generously with olive oil & sprinkle with salt & pepper. Roast at 400 for about 15-20 minutes. 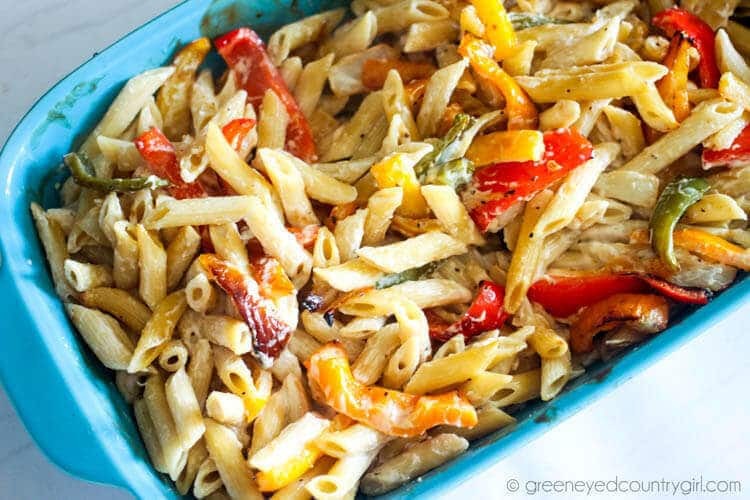 While the peppers and onions are roasting, cook the penne according to package directions. Drain penne and set aside. 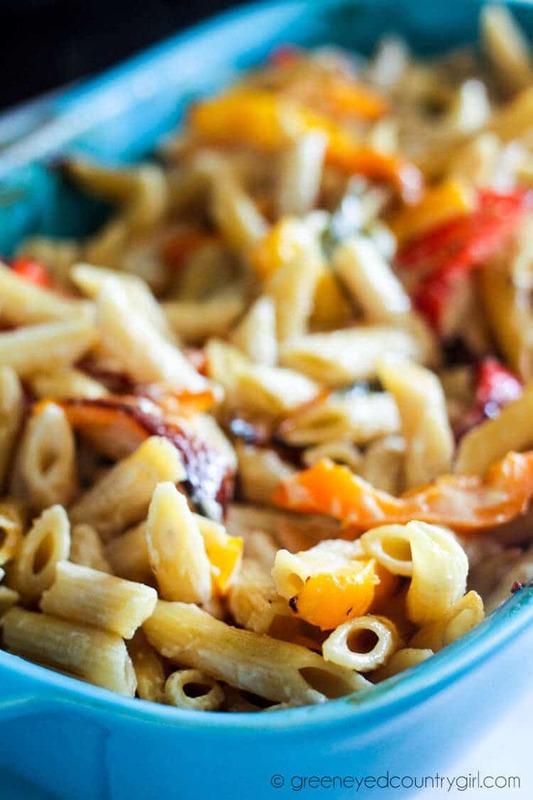 After the vegetables have roasted, mix together penne, vegetables, & alfredo sauce.